This hammock is made of parachute fabric, which is strong, durable and breathable. And the weight capacity is 300kg ideal for stealth and wild camping. It is attached with an ideal drawstring pouch to make the hammock easy to carry and use. 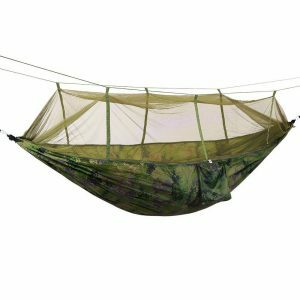 The hammock can be folded into the pouch which is attached to the side of the hammock when not in use. There will be no bothering by mosquitoes or other insects with its special fine insect netting.